Iowa State University, the Iowa Department of Agriculture and Land Stewardship and the Iowa Department of Natural Resources announced that the Iowa Nutrient Reduction Strategy Annual Progress Report is now available to the public. "We are committed to robust measuring and reporting around each of the steps necessary to reach our water quality goals," said Mike Naig, Iowa Secretary of Agriculture. "This report shows progress in each of the areas measured. We are encouraged by the efforts of the public and private sectors to implement conservation practices across the state, and are working to build on this success going forward." "The Nutrient Reduction Strategy is a very important and critical effort working to enhance water quality, and to see positive changes and results is gratifying," said Bruce Trautman, acting director of the Iowa DNR. "We are continually committed to improving and protecting water quality, and with partnerships developed through the strategy, we are making great strides, but we still have work to do to meet the goals." The annual report provides progress updates on point source and nonpoint source efforts to reduce nitrogen and phosphorus loads leaving the state. The report follows the "logic model" framework that identifies measurable indicators of desirable change that can be quantified, and represents a progression toward the goals of achieving a 45 percent reduction in nitrogen and phosphorus loads. The framework recognizes that in order to affect change in water quality, there is a need for increased inputs, measured as funding, staff, and resources. Inputs affect change in outreach efforts and human behavior. With changes in human attitudes and behavior, changes on the land may occur, measured as conservation practice adoption and wastewater treatment facility upgrades. Finally, these physical changes on the land may affect change in water quality, which ultimately can be measured through both empirical water quality monitoring and through modeled estimates of nutrient loads in Iowa surface water. "The report highlights the increase in activities in the five years since the release of the Iowa Nutrient Reduction Strategy, which is encouraging," said Matt Helmers, Director of the Iowa Nutrient Research Center at Iowa State University. "But, it is also important to recognize the scale of change required to meet nutrient reduction goals, and the need for increased levels of practice adoption and implementation throughout the state." $512 million in private and public sector funding for Nutrient Reduction Strategy efforts identified during the 2018 reporting period. Long-term funding is now in place that will provide an additional $270 million for conservation practices and wastewater treatment upgrades over the next 12 years. Of the 154 municipal wastewater plants and industrial facilities required to assess their nutrient removal capacity, 125 have been issued new permits and 82 of those have submitted feasibility studies on potential technology improvements to reduce nutrient loss. The Conservation Infrastructure Initiative engaged a broad cross-section of leaders within and outside of the agriculture industry to address barriers, innovative market-based solutions, and new revenue streams to improve water quality. Partners reported 511 outreach events focused on water quality were held in 92 counties. Partners reported 45,800 participants attended an outreach event. Statewide estimates indicate 760,000 acres of cover crops were planted in 2017, including 330,000 acres enrolled in government cost share programs. 1.8 million acres of land were enrolled in the Conservation Reserve Program, about 200,000 acres more than in 2011. Iowa has an extensive water quality monitoring system in place, including 32 more real-time nitrate sensors deployed by the University of Iowa’s Hydroscience and Engineering - IIHR than in 2016. At least 88 percent of Iowa’s land drains to a location with water quality sensors installed and maintained mainly by the Iowa Department of Natural Resources, Hydroscience and Engineering - IIHR, and the U.S. Geological Survey. Surface water samples are collected regularly at 302 locations, plus 582 edge-of-field sites by the Iowa Soybean Association and Agriculture’s Clean Water Alliance. The annual report works towards evaluating progress using an updated baseline that is consistent with the Gulf of Mexico Hypoxia Task Force and follows the direction of the Iowa Legislature. The baseline looks at the 1980-1996 time period. In future reports, the baseline period will be used to measure progress toward water quality goals identified by the Iowa Nutrient Reduction Strategy. The annual report was compiled by the College of Agriculture and Life Sciences at Iowa State University with support from the Iowa Department of Agriculture and Land Stewardship and the Iowa Department of Natural Resources. 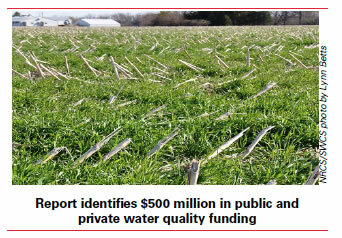 A draft of the report was shared with the Iowa Water Resources Coordinating Council in November and their feedback was incorporated into the recently finalized report.